In countries where drinking yerba mate is part of the local culture, it is not at all unusual to see people carrying thermos flasks all the time. They are a faithful ally that allow people to enjoy a hot mate virtually anywhere: at work, at the beach, at the park and during their travels. Modern aluminum thermos flasks are extremely popular due to their practicity and durability. The shock-proof aluminium thermos was indeed a very welcome substitute to the previously widely used glass interior thermoses. But unfortunately a quality aluminum thermos is costly and the market is now flooded with products made out of budget and health hazardous alloys, usually imported from Eastern countries like China. These Chinese “Cheapos” are much less resistant to the corrosion caused by hot water. With time, impurities from the corroding metal are transferred to the water, with consequent health risks. Due to this, thermoses made from such cheap materials have been prohibited in most nations, including Brazil, Uruguay and Argentina. Unfortunately, due to poor law enforcement, these flasks are still easily found in supermarkets and also in street markets. 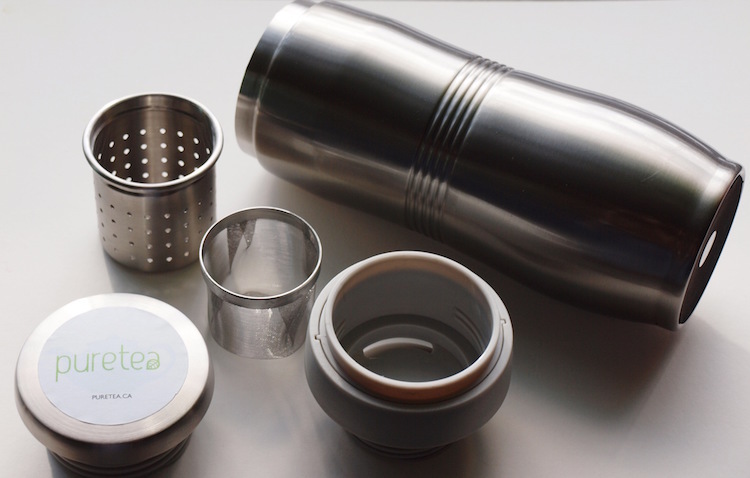 Toxic steel thermos are considered unsuitable for food contact and also exhibit impurities in their composition, such as: copper, lead, mercury and arsenic antimony, among others. There is legislation in some countries stating that these particles can not exceed 1% of the total composition of the steel, but some Asian thermoses, are made from materials which exceed well over 10%, containing excess nickel, copper, cadmium and manganese. Such low grade steels can be up to 15 times cheaper than the kind authorised by law, making the end product irresistibly cheap in comparison to others. Indeed, low grade metal flasks can cost up to five times less than quality stainless steel flasks. Thus price is a good indicator of product quality – though not the only one. In most countries, imported flasks that have been marked as safe will carry some kind of seal stamped on their outer surfaces, but seals can be easily forged, therefore seals by themselves are not a safe indication either. In the Mercorsur Economy Zone, a study has been carried out to understand the effects of the exposure to toxic steel. The results show that toxic steel can be especially dangerous to children. Continued exposure to toxic steel has the potential to cause attention deficit, delays in speech, impaired growth and IQ, along with some digestive problems. In adults, this poisoning can cause hypertension, lack of muscle strength, paralysis, lead colic, sexual impotence and kidney dysfunction. Examine the interior of the flask. If it presents seams or welded cuts, then it is most likely a low grade flask produced with potentially dangerous material. Real steel thermos have closed tubular shapes without any joints. Use a magnet to test the flask’s magnetic properties. If the magnet sticks, then the material is most likely not aluminium and may present potential hazards. High grade steels will usually not attract a magnet,but even this test may not be accurate, since some high quality steels can have a content of other metals that are magnetized. Overall, there is no one simple factor to ensure that you are buying a good quality flask, but rather a combination of factors. When shopping for your new mate thermos, make sure you look for all these signs and use your common sense! Buy only from trusted shops and if something looks fishy, then shop elsewhere. A good thermos will last you several years and bring you a lot of mate drinking joy, so save your money elsewhere and make a good investment here.